If you only eat eggs for breakfast you are certainly missing out since eggs can make a delicious meal any time of day. This week the Sunday Supper Taste-Makers are honoring the humble egg with mouthwatering recipes the can be eaten any time of day. Loosely modeled after Jamie Oliver's Rolled Bread Sandwich this recipe is easily adaptable to your tastes and makes a delightful entree for breakfast, lunch or dinner. I love to serve it fresh out of the oven, when the cheese is still hot and melty. Though it is equally tasty at room temperature or even leftover the next day. Roll out bread dough into a long rectangle about 1cm/½ inch thick. This should end up being about 39 inches long and about 8 inches wide. Along the middle of the bread, lay out your prosciutto, eggs, cheese, basil and tomatoes. Drizzle with extra virgin olive oil and season with salt and pepper. Pull the dough over the filling so it forms what looks like a cannelloni shape. Seal the ends. Transfer to a flour-dusted baking pan, allow to rest for 15 minutes, dust with flour and place in your preheated oven at 180ºC/350ºF/gas for 35 minutes until golden. This is such a creative recipe. I've never seen anything like it. So perfect to serve for a brunch party. Oh, yeah! I'd definitely eat this hot so the cheese is gooey! What a fabulous loaf!! This sounds awesome! I never would have thought to add eggs! I could eggs all day long---and stuffing them into bread--genius! This is beautiful! It's one of our fave's. I've never thought to put eggs in it. Next time I will! My kind of egg sandwich! I've never had anything like this before. I need to give this a try! I love fresh bread out of the oven! This looks amazing! What a yummy surprise in the middle of this fun loaf!!! I've not seen anything like this before! A very creative recipe! Is Fontina cheese especially good for this or can I use fresh mozzarella? This is a very clever recipe. I could see this at a party or gathering and would be enjoyed by everyone! Wow what a great line up of dishes! Looks like a great bunch. 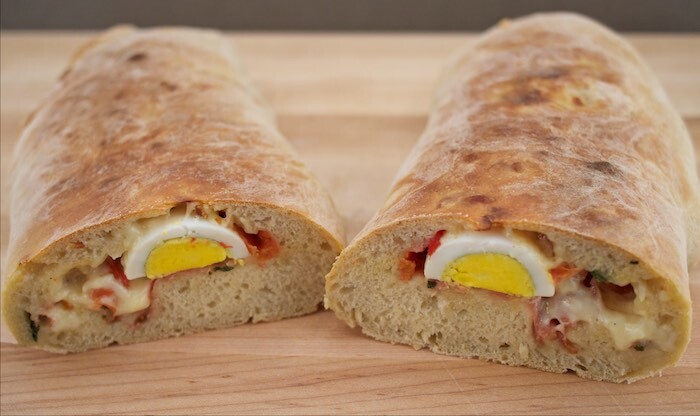 I love the use of hardboiled eggs in this stuffed bread. They must be delicious with the prosciutto and fontina. I would definitely dig into this for lunch! Oh yes, i made one yesterday stuffed with dill, scallions and goat cheese ! Love this bread ! And wouldn't that be a lovely meal to carry! We're coming into the season that I stop and eat lunch in parks, and this would be so easy to carry and such a treat! Well since I am a bread fanatic this looks awesome. It would be perfect to make for a nice little party....wow I think I might just have to give this one a try. this is like pizzaa...in the form of sandwich!!! looks so good. oh I love this.. it has me ready to get in the kitchen. Yum! Stuffed bread like this just looks amazing! I love that you're using eggs in the stuffing. I think this qualifies as a complete meal! Can't even tell you how in love I am with this recipe! I have *got* to try it - beautiful!